thecheapsidestandard | New gen on old London. Steelyard (Stilliards) operating in 1572, marked on the Hogenberg panorama. In return for their privileges the influential foreign merchants maintained the City’s Bishopsgate and would summon a third of the men required to defend it when necessary. The King’s crane-balance for weighing the tonnage of goods arriving in London’s port was based here before moving to Cornhill. It must have been a familiar waterfront landmark for Londoners. The Steelyard wharf and stairs detailed in Wenceslaus Hollar’s 1647 panorama. Cockneys NB: Bow Church in the background. The Hansa influence on London’s arrival centre stage in world trade was immeasurable. According to Stow they imported “wheat, rye and other grain” plus “cables, ropes, masts, pitch, tar flax, hemp, linen cloth, wainscots, wax, steel and other profitable merchandises.” Centuries before Vorsprung durch Technik, Hanseatic attention to detail and quality was legendary – from pottery and simple brass thimbles and pins to the pewter for which the City was renowned. German imports were often the ones to own, and Londoners knew it. The Hanseatic League globalised trade and introduced the towns they occupied to new territories. Distinctive coin-like jettons used by the Hansa for accounts and lead seal hallmarks for wool were unearthed during Museum of London Archaeology excavations at the Steelyard in 1989. The same items are found right across free-trade Europe, from Scandinavia to the south. Yet time and geography would prove the Steelyard’s downfall. Upstream from the growing blockage of London Bridge, the wharf was crucially the wrong side for access to the ocean and the world’s ships. The Steelyard was still a notable landmark in 1746 when Rocque was engraving away. 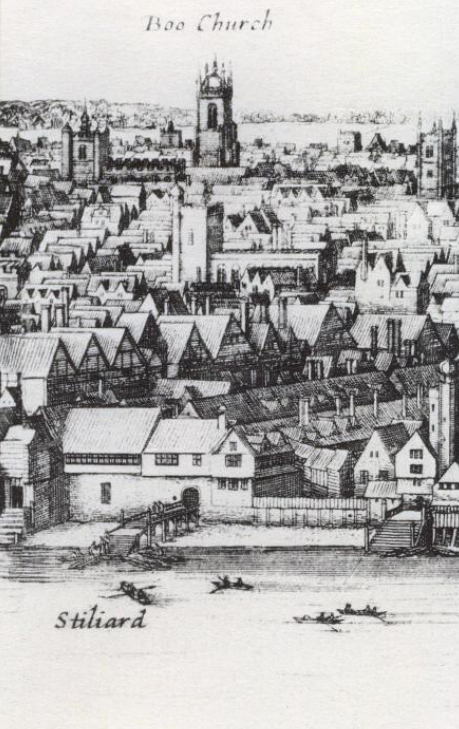 Of the 24 Legal Quays described in 1559, just three were above the bridge, including the Steelyard. In 1552 during the tumultuous reign of Henry VIII’s son, Edward VI, the Hansa’s economic stranglehold on the City had been broken, encouraged by a challenge from indigenous ‘Merchant Adventurers’. Edward’s half-sister Elizabeth I would go a step further in 1597/8 (when Stow was writing), commanding the Stilliard merchants to quit the city for good – think the Chinese taking back Hong Kong. The League still owned the premises, which were initially rented to Her Majesty’s Navy for storage. Since 1853, though, virtually every trace of the once mighty Steelyard has been hidden under Cannon Street Station and its railway bridge. The footprint of this economic powerhouse can still be made out and (almost) paced, however. 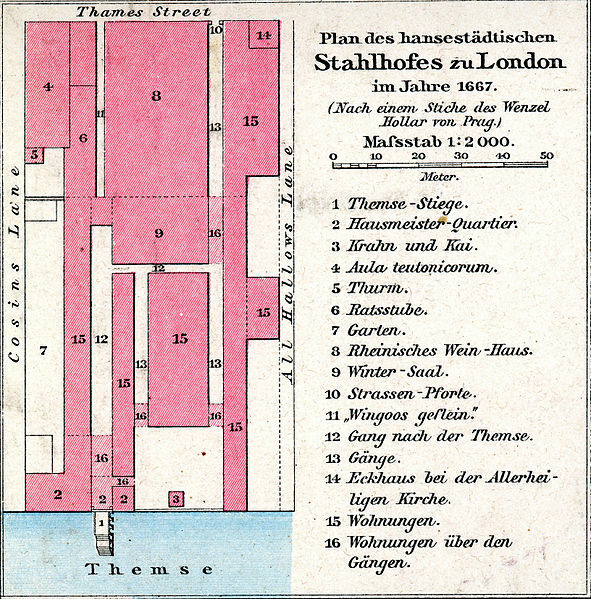 A plan of the Steelyard. It is still possible to walk the ancient perimeters except the Thames. The crane is item no 3. In Samuel Pepys’ time Dowgate Stairs, one of hundreds of river taxi drop-offs, led from the shore up what is now a skaters’ hangout, Cousins Lane, to Dowgate Hill alongside the Walbrook river. 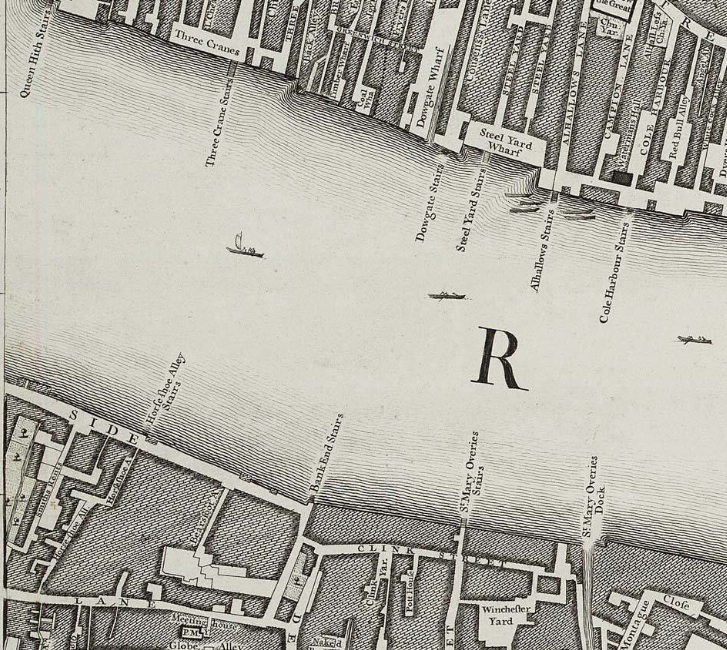 The diarist was drawn to the Steelyard by its trendy ‘Rhenish winehouse’ (no.8 on the plan) and, from a boat on the river, he watched the Great Fire’s flames lick its walls. Today The Banker public house offers fine ales and wonderful views over the water where the Steelyard once weighed the world. 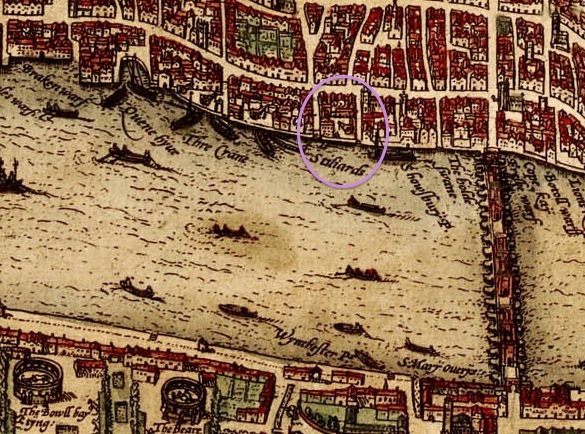 The next north-south thoroughfare along towards London Bridge, Allhallows Lane, marks what would have been the eastern edge of the Hanseatic presence. The two lanes are connected on the north by Thames Street, just as in the old days. In 2007 there was a fun Thames Path proposal to link the two lanes on the south via a walkway hanging over the river outside the pub which was grumpily canned on safety grounds. 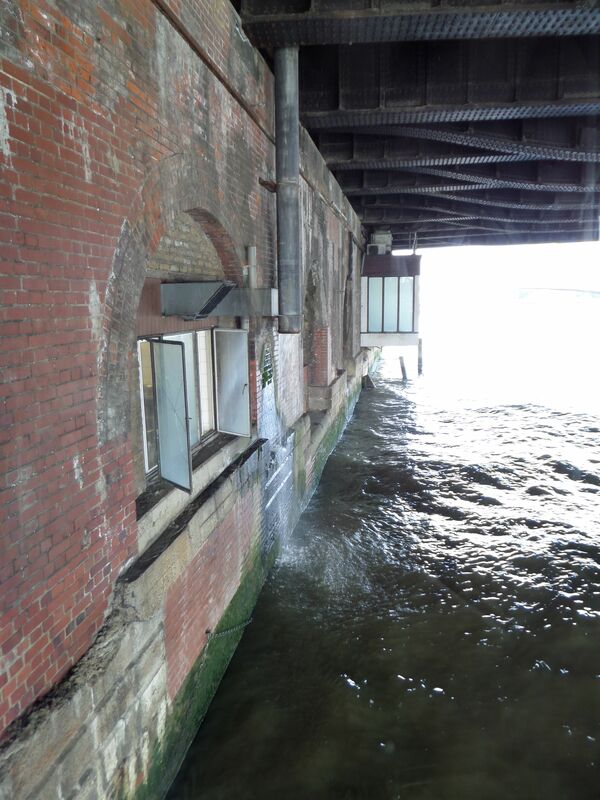 Instead, the pedestrian is diverted under Cannon Street bridge through Steelyard Passage. Here meandering floor lights dimly resemble the course of the Thames, while wall-mounted speakers project clanking and hubbub, suggestive of the old workers and wharves of the middle ages. 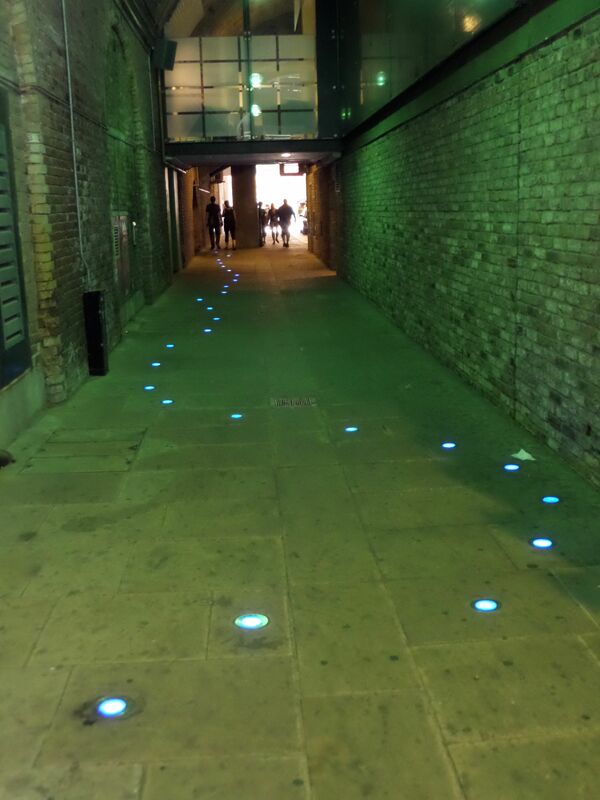 Lighting the route of the Thames – Steelyard Passage. 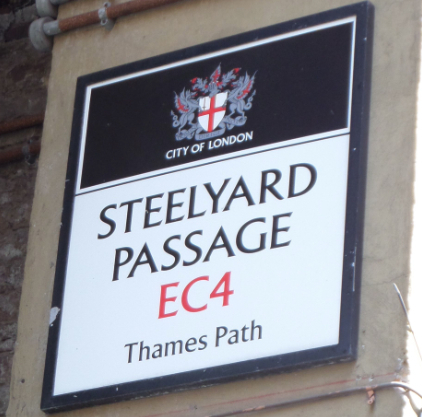 As hard as the City Corporation has tried, Steelyard Passage requires immense imagination to summon that fourteenth century heyday. The modern metropolis’s trains rumble and grind overhead, throwing in the odd curious howl of steel on steel, like a ferrous Hound of the Baskervilles. From the outside wall of the Banker a long vertical outfall pipe, a few feet in diameter, pokes out roughly where the Steelyard Stairs would have been. Through it spews the famous River Walbrook, once the span of several trading barges, now reduced hurling its fluid into the Thames like some some hungover raver. The enfeebled Walbrook presents a contrast to the mesmerising power of the tidal Old Father, for which there is no finer vantage point than a window seat in the Banker, as the river shoots round the pillars of Cannon Street Bridge. The Banker can be found here: http://banker-london.co.uk. The villagers of Crouch End have been quivering with expectation of late. Not at the arrival of a new multimillionaire burden on the civil list, but at the new cinema in Hornsey. Up to now, typing “N8” into Flickster or similar apps was a resentful act, with the knowledge that the results would show that the Muswell Hillbillies had an Odeon, Wood Green (the journey of last resort to Crouchenders) has two multiplexes, and poor old Hornsey has no silver screen at all. Not for long. In conjunction with Curzon the new ArtHouse is set to pop its corn round these parts from the autumn. The two-screen, 190-seater will inhabit a modestly lovely Edwardian building used as a music venue until earlier this year. It had previously served as a snooker hall, but was recently saved from repurposing as a lap-dance house only by vehement local protest from the curiously-named Lap Off!, and from Rokesly Junior and Infant Schools, opposite the putative flesh-pot. 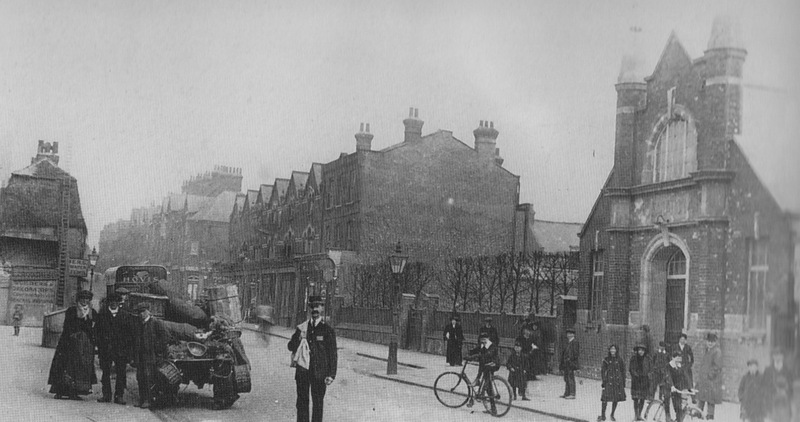 Tottenham Lane – the Sally Army citadel is on the right. A postman is in the middle and a greengrocer’s truck on the left. The name of Cornwall-born novelist, Methodist preacher and local resident Silas Kitto Hocking will remain inscribed in a foundation stone on the front of the new multimedia venue, to the left of the entrance. It is a relic of the building’s original role as a Salvation Army citadel in 1913. Although the hostel was damaged by bombing during World War II the Christian soldiers marched onward until 1976. Though now forgotten, Hocking was one of Crouch End’s most celebrated twentieth century inhabitants, and can be found in the 1911 Census living at ‘Heatherlow,’ 10 Avenue Road. The large house still stands just up from the junction of Coolhurst Road and Crescent Road. The size of his property is not the only measure of his success. When he died aged 85 in September 1935 the author left Esther, his widow, £18,836 – equivalent to three-quarters of a million pounds in today’s money – and it was said he earned four times that over the years from his wholesome hardbacks. Neatly for ArtHouse, four of Hocking’s works were actually realised for the cinema, including his bestselling story of slum life in Liverpool, ‘Her Benny,’ in 1920. It was the second of his seventy books published. Hocking had sold the rights for £40 but was concerned how the big screen might treat his baby. 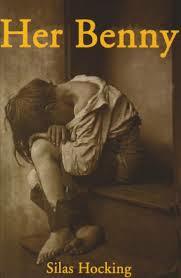 Her Benny – everyday tale of impovershed Scousers. Crouchenders harbour few such worries about the longed-for trendy cinema. Let’s hope it too exceeds expectations. UPDATE: The ArtHouse quickly became part of the Crouch End cultural landscape and has won several awards: locals love it. Yet soon after it opened a vacant site just a few doors down (the shabby but sizeable old Surman Brothers building) was acquired by the empire-building PictureHouse chain. By accident or design this address – 165 Tottenham Lane – was the same as Crouch End’s last cinema, a purpose-built 600-seater also called the Picture House, which closed in 1940. The new multiscreen venue, opening in a matter of days, will be larger and have more facilities than the ArtHouse, but many customers say they will retain their allegiance to the bijou curtain-raiser. Can N8, a cinematic desert for 75 years, suddenly sustain two magic lantern venues? I reckon so. In the 1930s boom times, as the fascinating new project London’s Silent Cinemas reveals, there were five silver screens within the virtuous triangle of Hornsey, Muswell Hill and Crouch End. Symbolically, the two venues will clash head-to-head over the new ‘Star Wars’ film, but both should come out of that as winners. Just a shame neither of our new cinemas is called the Empire. John Glanvill of Chancery Lane – MP, lawyer, excusotron. On 18 September 1625 London lawyer John Glanvill, on business in Plymouth, submitted to Charles I’s counsel a document he hoped would opt him out of his appointment as the crown’s observer on a huge, ill-starred naval attack against the Spanish at Cadiz. The submission was archived as “Mr Glanvills reasons against his being imployed for a Secretary at Warre.” What follows is a transcript of his excuses and the background to them. Well, he got this right: the handwriting is devilish bad. A pretty poor opening gambit nonetheless. Tugging at the heartstrings now. 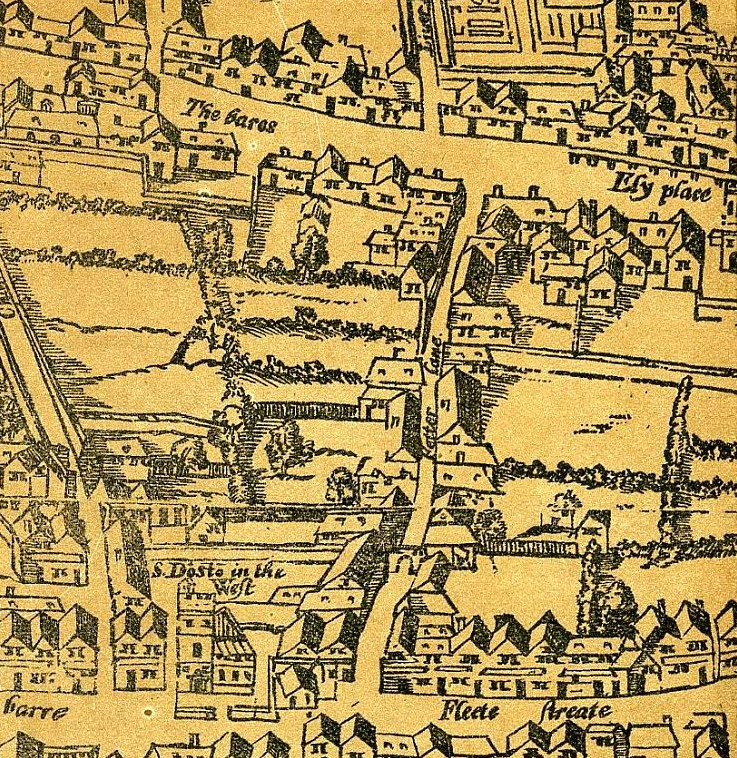 The six children were William, Mary, Margaret, John, Francis and Walter – an unnamed child had died at birth six years earlier in March 1619 at Church Yard Alley, Fetter Lane, running adjacent and to the east of Chancery Lane. John and wife Winifred would have two further children: Elizabeth and Julius. The precise whereabouts of his house on or near Chancery Lane are now unknown, but the King’s men would know it was just one of several properties in the Glanvill portfolio. His father, John the Elder, acquired numerous estates in the west country through the patronage of the Duke of Bedford. The Elder, a district judge who died in a fall from his horse on circuit in 1598, when son John was in his early teens, left him Kilworthy, a fine manor north of Tavistock, Devon, but John generously handed it to his older brother Francis. He had estates in Hampshire and Devon, and in later years he made his main domicile at Broad Hinton, Wiltshire, yet his letter to a Mrs Scott in Cocklebury in the same county in 1652 was dispatched from Serjeants Inn, Chancery Lane – he had been made serjeant in 1637. Incidentally, £60 rent is the equivalent of around six grand today. Very good luck in finding a pad in Holborn for that these days. He has a point: the King was expecting him to disembark from Plymouth at the drop of a hat and be away on this mission for perhaps months. This is also the first documented mention of John’s ‘sicknes’, which recurred sporadically throughout his life – and eventually saw him off in 1661. Sadly the only clues to what the illness was simply describe how it laid him low for extended periods; tantalisingly, there is no discussion of symptoms. The child-minding friends in Devonshire and Gloucestershire are easily imagined: he hailed from and worked in the former county and his wife Winifred was the daughter of Sir John Bourchier of Barnsley, Gloucestershire. The Herts and Beds connections require further investigation. John was a commercial lawyer as well as MP and Recorder for the Plymouth corporation at the time. According to this submission his legal documents and case files were stored at Lincoln’s Inn, where he had trained and been called to the bar, and in his place next door on Chancery Lane. His argument is that sensitive manuscripts would be left as they are, unattended, in his absence. At Lincoln’s Inn a splendid portrait of John (as well as one of his father) is still viewable by appointment. This makes absolute sense. Apart from his paid counsel to corporations such as those of Plymouth, Okehampton, and Launceston, he was an extremely active MP and sat on numerous commons committees, particularly those related to his obsessive campaign against market monopolies and rotten boroughs. Eleven speeches in the House and appointment to 16 conferences or committees in 1625 was a pipe down from his peak the year before of 84 speeches and 47 appointments, but this could be explained by his debilitating illness. If in doubt, mention Mum. Glanvill’s redoutable twice-widowed mother, Lady Alice Godolphin (née Skerrett – she had remarried to Sir Francis Godolphin) was in her mid-70s at the time and died in 1632 aged 82. 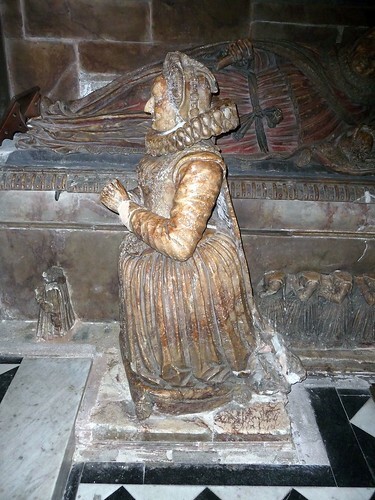 There is no evidence of frailty; her likeness in a memorial in St Eustachius, Tavistock, is a powerful one. It was always unlikely a whinge about lucrative clients switching allegiance might butter the King’s parsnips, even though some of them were illustrious and influential. What the information does confirm is that he entered Lincoln’s Inn in 1603, around the age of 17, and was called to the bar in 1609. If begging wouldn’t work, perhaps a gentle reminder of what John had already done for His Maj would do the trick. And it was considerable. He, along with mayor of Plymouth, Nicholas Blake. and another merchant, Thomas Sherwell, were the members of parliament for Plymouth who received the King and his extensive household in September 1625, during which visit this document was written. The King’s agents also took the opportunity to press 500 men into naval service for his Raid on Cadiz under the command of Edward Lord Cecil. Who could do more for Charles than allow all this indulgence! In the end the protests were to no avail. Sea-sick Glanvill was made secretary at war for the ill-conceived Cadiz raid and it was a cataclysmic flop. He took his revenge in two very lawyerly ways. And secondly, in 1626, a year after the raid, Glanvill was one of the eight chief managers in the impeachment of the King’s favourite, the Duke of Buckingham, whose idea the raid was. Charles reacted by dissolving Parliament. And thus was erected another signpost along the road to Civil War. Each week brings a further reminder of that wisdom. My forebear Joseph Glanvill (pictured), philosopher and religious sceptic, was a member of London’s Royal Society. I could admire him simply for that, and the fact he coined the phrase ‘climate of opinion’ and hunted ghosts with the alacrity of Derek Acorah. But his book ‘The Vanity Of Dogmatising‘ (and what a title that remains) offers extraordinary musings on the Shape of Things to Come. He elaborates: ‘Let the friends that would communicate take each a dial; and, having appointed a time for their sympathetic conference, let one move his impregnate needle to any letter in the alphabet, and its affect fellow will precisely repeat the same.’ And hey presto, folks can go 121 on different sides of the globe. Foreseeing the process that would lead to the telegraph, the telephone, the internet, mobile telephony and instant messaging is all very well, until you consider that Joseph Glanvill was writing in 1661. That is 155 years before Richard Babbage conceived his ‘difference engine’, 175 years before Samuel Morse unveiled his Morse Code, and 350 years before Microsoft bought Skype for $8.5bn. Seven years ago I stumbled across a book mis-catalogued by the British Library, or rather its predecessor the British Museum Library. 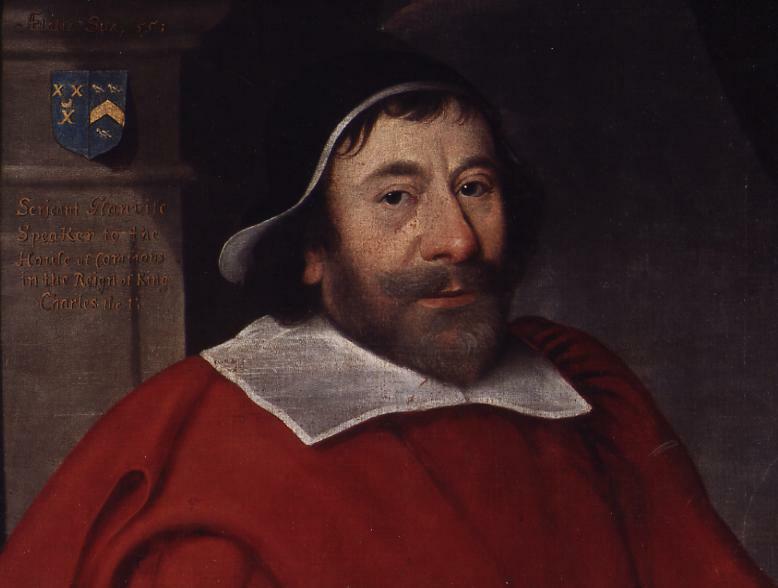 Intriguingly, it connected a prominent ancestor, Sir John Glanvill (pictured), with imprisonment in the Tower of London in the 1640s and offered possible answers to other passages in his life story. The book had been indexed as ‘J. G. Canoyle’ but I indulged my hunch and was thrilled to be vindicated when I viewed it. Sure enough, the cover read: ‘a Paraphrase uppon the Psalms of David by Sir [crossed out] John Glanvill knight, one of the King’s Serjeants at Law, late Speaker of the comons house of Parliament.’ I found a date – 10 January 1645 (old style, so 1646 by today’s calendar) – and saw it had been purchased at Sotheby’s in 1881. 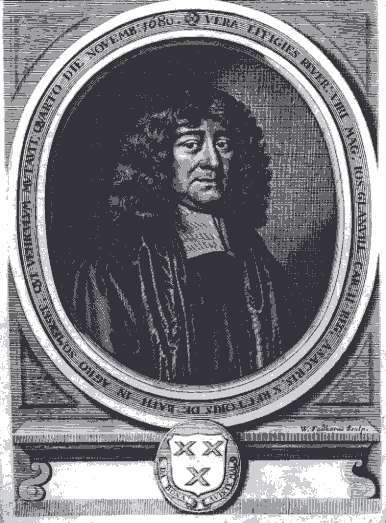 Glanvill, the son of a circuit judge, was an influential political figure in the first half of the C17th. I already knew he had married Winifred Bourchier in 1615 and that they had had seven children who reached adulthood. As an MP and lawyer records suggested he had embraced social reform, opposing rotten boroughs and King Charles I’s excessive tax-raising schemes. Although he lived the high life he did not appear anti-Puritan. Yet, puzzlingly, when civil war came he first brokered for peace, then sided with the King and was eventually imprisoned as a traitor by Parliament. Diarist John Evelyn claimed John had even burned down his mansion in Broad Hinton, Wiltshire, to prevent it being garrisoned by Cromwell’s forces. These events are reasonably well documented though not explained. But a lengthy note in the book of psalms – a primary source gift to any family historian – would add compelling detail to his story. The handwritten note is at various times a dedication to his ‘loving wief’ Winifred, a biography, a plea for deliverance, and a chronology of his psalm-rewriting. The latter reveals that among his sources for David’s psalms were the bible versions of King James and ‘Mr Calvin’. Calvin’s reformed protestant views were shared by Parliament rather than Charles I and his Archbishop, Laud. John’s cousin, Joseph Glanvill, was also a noted Christian philosopher and sceptic, and the family was far from being High Church, pro-Catholic, so there is a further puzzle over his civil war leaning. In one passage John describes: ‘the losse of my chief mansion house of Brodehinton [Broad Hinton] in Wilteshire, burned down by a comanded partie of the King’s forces in may last , alleadyng for there reason that they did it only to prevent the Parliament forces of making it a garrison for there service’ – a crucially different take on the event to Evelyn’s, and hardly likely to enamour him to Charles. Perhaps he had been promised favours; perhaps he had no faith in a republic. The first point about sons recently dead led was intriguing. I knew of one – Francis Glanvill, a long-serving professional officer in the King’s army, slain at the siege of Bridgewater six months before the note was written. All other sons recorded lived beyond 1645, setting me off to discover another. Eventually I found Walter Glanvill, son of John and Winnifred, in the St Dunstan-in-the-West parish register, baptised 24 Feb 1623. It remains to be seen whether he died in the 1640s. The St Dunstan baptism entry for John & Winifred’s previously unrecorded son Walter. The recurring ‘dangerous sickness’ was probably what saw John off in October 1661. He had complained about it confining him to bed as early as 1626; one possibility I am exploring is that it was malaria, and there are tantalising hints that he traveled widely through his commercial and legal work. The chronology of John’s imprisonment is laced through the text: ‘being taken prisoner and so carried to Oxford [after July 1643] where I long remained under the restraint of a command in the tyme of these unaturall civil warrs’, and ‘here [ie the Tower] where I am now a prisoner and have so bin ever since the 20th of June 1644… ‘. The inner ward buildings where John Glanvill is most likely to have been kept prisoner. John was eventually released after four years in the Tower in 1648. He was forced to surrender rents from his various properties to make up a fine of £2,320 (over a quarter of a million in today’s money) for his High Treason, but was briefly restored to the position of King’s Serjeant on the restoration of the monarchy. The recent chance discovery of a handwritten book of psalms still provides clues to put flesh on the bones of this ancestor from four centuries ago. Further proof that the evidence is out there: you just need to know where to look. 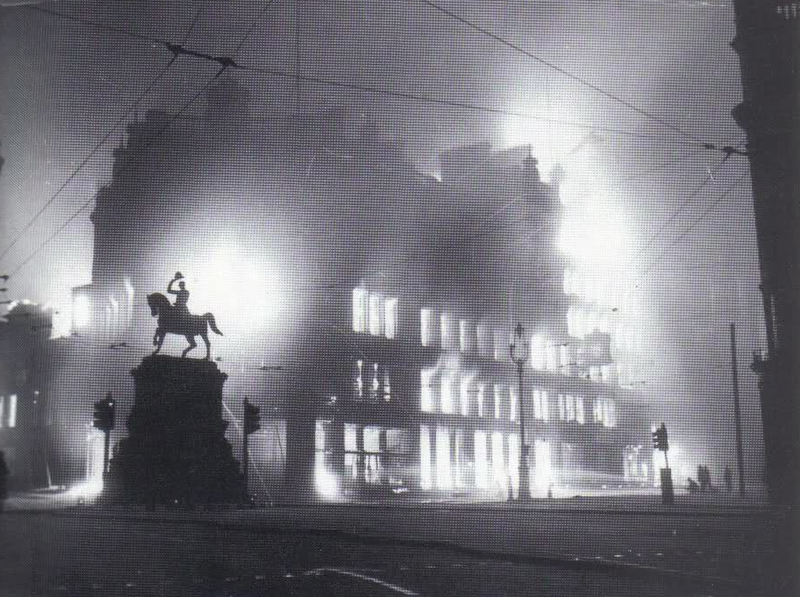 The Wallis department store (and Thavie’s Inn) in flames. Prince Albert’s statue bids farewell. Perhaps it is sufficient comment about the effect they had on him that my father very rarely spoke about three explosions which had such a huge impact on his early life in London during World War Two. Derek James Glanvill was born at Thavie’s Inn, Holborn, in August 1929, and grew up there in a loving family with his father Percy and mother Ethel, and younger brother Roy. Percy was the warehouseman for a renowned books and engravings publisher, Virtue and Co., of 19-21 Thavie’s Inn, and the job provided spacious living accommodation on the premises, anciently one of the inns of court, where student lawyers trained; it was mentioned in Dickens’ ‘Bleak House’. The Glanvills occupied the top floor of the old building, and a wealthy bookmaker and his family lived on the storey below. The bookmaker’s sons were slightly older than Derek and Roy, so the luxurious toys of which they grew bored were passed on and stored in a huge trunk in the corner of the large living room. Anything from train sets to air rifles, otherwise unaffordable to a warehouseman’s children, found their way up the stairs. Like so many London youngsters the boys were evacuated soon after war broke out and were placed with various families in Croxley Green in Hertfordshire for around a year. On the night of 16 April 1941. 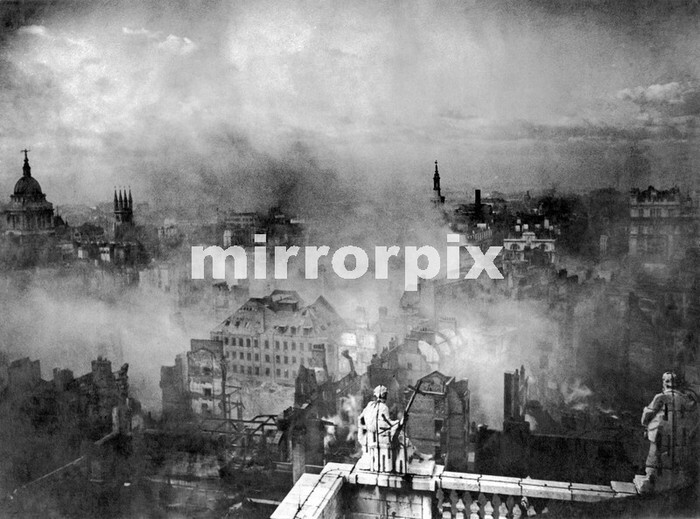 Wren’s church, St Andrew, was hit by incendiaries and destroyed. Likewise the department Wallis & Co., celebrating its 115th birthday with a sale at the time. The fire engulfed Thavie’s Inn too. Firemen fought the blaze all night and day, but to no avail. Percy and Ethel and their fortunately absent sons, aged 11 and 7, had lost virtually everything: possessions, home, childhood. The brothers were brought back to London when newspapers carried details of a bombing raid near Croxley Green. Stomping up to Hertfordshire, Ethel announced that if they were going to be killed they would die with their parents. The city was now very different, of course. Percy had found work and lodgings at Barclay’s Bank on Wardour Street, Soho, while the boys – whose school had closed, ending their education right there and then – treated the ravaged heartland as their playground, and shrapnel as collector’s items. 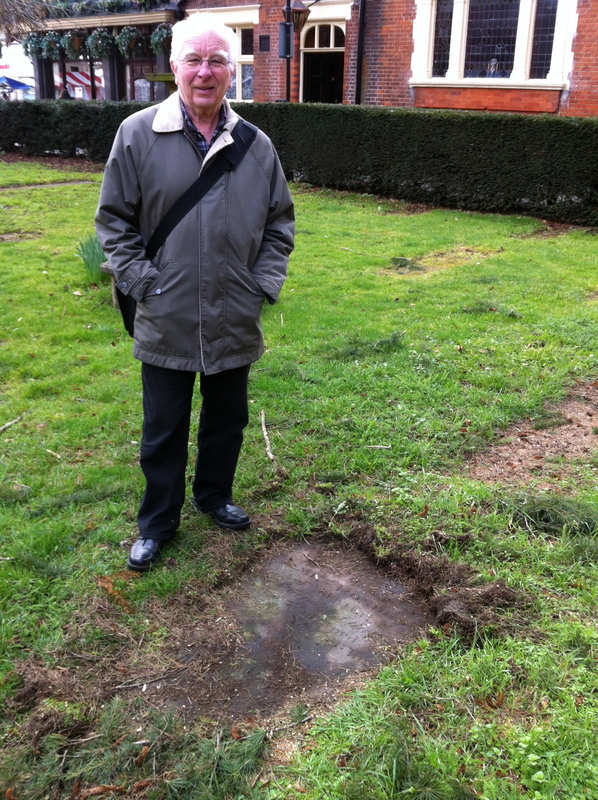 Roy recalls the brothers and their friends coming across an unexploded incendiary. Rather than alert the authorities, they threw stones, and dropped it from heights in an attempt to see it explode. Luckily they were unsuccessful, or I might not be here to report the fact. London in flames, viewed from St Paul’s Cathedral. The city my father returned to. When not capering in bomb sites, Derek and Roy earned a few pence singing in the choir at St James’s church, Piccadilly. It was after a service around 11.15 on Sunday 18 June 1944 that the boys set out towards the Palace of Westminster – their curiosity had been roused by the rumour a bomb had landed there. Regular explosives were not the chief concern by then. 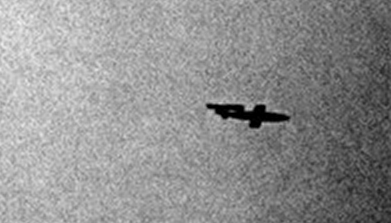 Hitler’s long-rumoured ‘pilotless aircraft’, the V1, was terrorising the capital. As they reached the Cenotaph on Whitehall they heard the uniquely gut-wrenching drone of an approaching flying bomb. Worse, the distinctive pulse of the engine stopped – at which point, they knew, the doodle bug began its deadly descent. A V1 flying bomb, or doodle bug. Looking up, they could see the flying bomb was headed straight for them. The only other person in the vicinity, a man across the street, also stopped in his tracks. Unlike in the films, none of them dived for cover, they just froze and awaited their fate. To their enormous relief the silent death passed just over their heads. They heard the explosion as it landed seconds later but didn’t consider the consequences too much. Until the next day, that is, when they heard ‘their’ doodle bug had hit the Guards’ Chapel at Wellington Barracks on Birdcage Walk during morning worship. One hundred and twenty-one soldiers and civilians were killed in the carnage, and 141 injured. It was the most serious flying bomb incident of the entire war. Perhaps this was why my father, a regular gambler, always considered himself lucky. At 14, schooling out of the question, Derek found work with an estate agent at Cavendish Square. He had already been through experiences few youngsters should. That was about to become far worse. Late in the morning on Friday 30 June 1944 a V1 landed at the junction of Howland Street and Tottenham Court Road. Again intrigued, my father took off on his bicycle during the lunch break to view the damage. What he witnessed affected him so deeply he raced home to Wardour Street in distress and was violently sick. The images branded on his memory that day returned to him throughout his life. Even now exact casualty figures are difficult to discern. Newbery collates those from Howland Street with a less destructive V1 blast on Whitfield Street on 19 June and records: 82 dead, 196 seriously injured and 376 slightly injured. Among those killed, it eventually emerged, was Sir Percy Alden, the Radical MP for Tottenham. Analysis of the home addresses of 44 of the dead – in Finchley, Hornsey, Holloway Road, Islington, Caledonian Road, Camden, Kensington Chelsea – suggests at least one of the buses may have been a no.14. Its ‘ghost‘ route, the 91, is one I use regularly; one of the victims, Herbert Bradford, lived in a house in Hornsey that I pass virtually every day. It is easier for me to connect with those details than it was to gain an insight into how those three devastating wartime events shaped my innocent young father’s life. And he was one of so many who had their own similar moments or worse personal losses. Not courage, perhaps, but something, certainly, was shattered. Stan up for women’s rights. Next to his ancestor’s grave. I have met hundreds of people through family history research. Some are long lost cousins. Others are researching the same ancestors but have no blood relation. An example of the latter is Stan Rondeau. Visitors to the remarkable Christ Church in the old Huguenot heartland of Spitalfields may well have been met and gret by Stan, who provides ‘living history’ as a guide there. To me, though, Stan is near-miss Huguenot kith and kin: his ancestor John Rondeau (1754-1802) was the second husband of Magdalene Levesque (1756-1840), whose first spouse was James Vernell (1755-1790); they are my five-times-great grandparents. Stan and I have met to share our research several times. A few months back we were exploring the local history archives in Enfield, where we knew of other individuals from the Rondeau and Levesque families. My seven-times-great uncle Peter (or Pierre) Levesque was ‘upwards of 50 years organist in this church’ according to the register of St Andrew’s in Enfield’s ancient market square. The words were next to his burial entry on 1 January 1823. He was 78 and lived on Chase Side. By coincidence I went to school opposite St Andrew’s and lived for a while on Chase Side – ancestral footprints and all that. I hoped the church vestry minutes might provide further information on Peter’s half-century at the Enfield wicket and possibly suggest a new link between the Levesques and the Rondeaus. Well, we learned much, including that in 1811 the parish paid Peter £9 15s 6d per quarter to play and tune the organ – around £1,300 a year today. Pipe-cleaner and player: Peter Levesque’s contract. Eleven years later ‘the situation of organist of this parish was declared vacant by the death of the late Mr Peter Levesque’ and a successor was to be chosen a few weeks later, each candidate to perform on the keyboard before a vote took place. Remarkably, Stan’s ancestor James Rondeau was one of those whose ears would pass judgement. There were four candidates: Miss Linton, Miss Leach, Mr Arnull and Mr Reeves. Tension rose when the vestry minutes for 6 March 1823 recorded that although, following the auditions, ‘a show of hands appeared and was declared in favour of Miss Leach’, sexism reared its head and a paper vote was demanded. Women were simply not supposed to take music-playing seriously in early C19th England. Reassuringly, James Rondeau pulled out all the stops and his vote was indeed placed under the original winner, Miss Leach. An anachronistic family crisis was averted. I discovered afterwards that the first female member of England’s Cathedral Organists’ Association was only elected 180 years later. 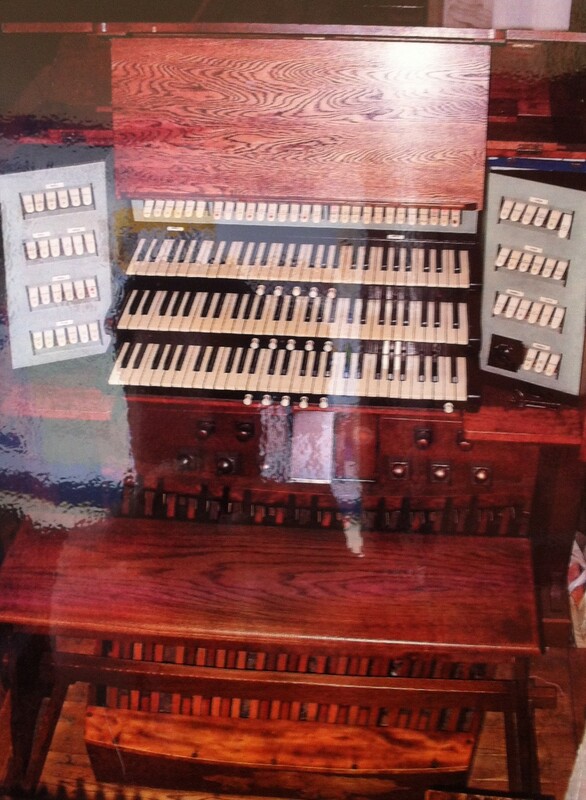 Organ of progress. St Andrew’s church, Enfield. Afterwards we strolled down to St Andrew’s church, where Stan inspected James Rondeau’s gravestone just that little bit more fondly. I surveyed the historic organ: tuned and played for 50 years by great uncle Peter, and then striking an early chord for Feminism, four years into the reign of Queen Victoria.